Simply the best way to heat and cool your facility or residence! Geothermal heating and cooling offers dramatic savings when compared to other energy types. and by experienced and knowledgable professionals!!! Heating and cooling via use of geothermal technology has been around a long time. It essentially taps into the temperature of the earth below the frost line, thereby heating and cooling buildings at significant savings. It's the world's most efficient way to heat and cool commercial buildings. There are two types of such geothermal systems. Each taps the earth’s inexhaustible supply of renewable thermal energy, underground or underwater, where temperatures remain fairly moderate at 45°-55°F, year-round. “Closed loop” systems use the earth as the heat transfer medium, employing a mixture of water and non-toxic antifreeze pumped through a continuous loop of sealed polyethylene pipes buried beneath the ground, vertically or horizontally. The mixture never comes in contact with the earth. “Open loop” systems draw water directly from a well and pump it through a heat exchanger at the geothermal heat pump, after which the water is returned to the source — just as clean as before. The Environmental Protection Agency found that, even on a source fuel basis — accounting for all losses in the fuel cycle including electricity generation at power plants — geothermal systems average 40% greater efficiency than air source heat pumps, 48% greater efficiency than the best gas furnaces and 75% greater efficiency than oil furnaces. Today’s best geothermal systems outperform the bes t gas technology, gas heat pumps, by an average of 36% in heating mode and 43% in cooling mode. Traditional systems have two major shortcomings. They heat or cool an entire building at once, with little or no ability to control comfort levels in individual rooms or zones. Second, they occupy tremendous space both inside and outside the building. A geothermal system creates an exceptionally comfortable working environment, giving tenants or building occupants precise temperature control, by room or by zone. Humidity levels are ideal. There’s no “blast” of hot air, or “cold blow.” Temperatures don’t fluctuate, so thermostats don’t need constant adjustment. Geothermal systems can compensate for morning or afternoon shade, heat buildup or temperature variance anywhere in a building. Larger areas such as conference or banquet rooms, auditoriums, indoor pools or fitness centers can also be controlled by separate heat pumps — so there’s no need to heat or cool the rest of the building if these spaces are used only occasionally. Geothermal systems are also much more compact than traditional systems, and out of sight. Mechanical rooms can be smaller. There are no boilers, smoke stacks or fuel tanks; no massive rooftop chillers requiring added structural support, labor and construction costs; no holes drilled in roofs to secure them either, reducing the risk of leaks. ; and, there is no above-ground equipment to be seen at all. In fact, the surface above a ground loop can be used for parking lots, walking paths or courtyards — an added plus for communities that want to protect or expand precious green space. And because geothermal equipment is usually underground (wells and piping) and inside (heat pumps), it’s not exposed to damage from weather or vandals. Dramatic cost savings are possible with geothermal systems. Heat from the ground is free, and the only electricity needed is for moving that heat between your home and the ground. 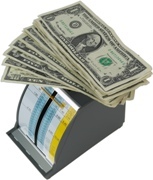 Spending the money to install and operate a geothermal system can provide payback in typically three to five years! Ground-source heat is a naturally renewable energy source and friendly to the environment. And if you had such a system installed, how would you like to have virtually free hot water? This is very possible! An attachment called a “desuperheater” can be added to your system - this connects your heat pump to your water heater. When the energy from the heat pump isn’t needed, it’s diverted to your water heater. For most of the summer, you’ll be getting virtually free hot water! Chelsea Heating and Air, Sobieski Services,ServiceMark, and Hentkowski, Inc. Please see our Links page for more detail regarding each of these fine companies.